While historians can point to the single event that set the war off (the assassination of Archduke Franz Ferdinand in Sarajevo on June 28, 1914) scholars still debate the underlying causes of the war, which are far more complex. Based on the 1996 miniseries of the same name, this site seeks to show that it is the combination of all the competing causes sited by historians and scholars that led to the eruption of unprecedented violence on a large scale. The site does this by presenting the war, its causes, and aftermath in four parts with additional sections that allow visitors to interact with material in different ways. 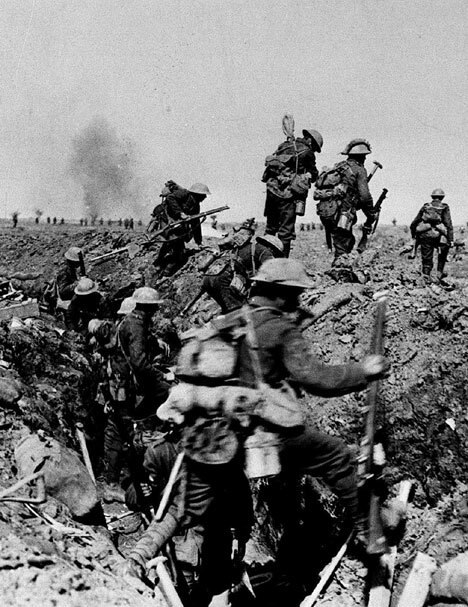 The purpose of this site is to provide a comprehensive view of WWI. The creator acknowledges that all topics are still not covered in as much depth as he would wish, but that is the goal he is working towards with the site. Overall, it is intended for general readership and as a jumping off point for students and scholars. This is an amateur historian and World War I enthusiast’s website which is comprised of a vast menagerie of material on the people, places and events that comprised the Great War, including photographs, primary source documents, information on the uniforms and weapons. This site attempts to be as comprehensive in scope as possible when addressing each topic it depicts by providing numerous perspectives and a variety of source material. There are interactive maps, a timeline, archival footage, historian’s commentary, clips from the miniseries this site is derived from, photographs, primary source documents, and links to additional information, websites, and books on the topics. The information for this site is primarily presented as articles on particular topics written by the site creator and other amateur historians. There is also a fairly extensive list of transcribed letters and diary entries from soldiers and civilians, as well as other primary source documents such as newspaper reports and government documents. Additionally, the site contains maps, photographs, posters and poetry. As this site is working towards being a comprehensive resource for the war, the list of topics covered include each of the major battles, biographies of important figures, the poetry and prose from the period, and the weapons and technology used among many other things. The material on this site is very diverse. Although the section for each type of material is not comprehensive, the site does succeed at presenting a wide scope of types of material and information. Material includes everything from traditional materials such as photographs, posters, maps, primary source documents, information detailing uniforms worn and weapons used, to more unique resources such as audio recordings of popular wartime songs and cadences, WWI films, and slang from the war. The audience this site attracts is clear from the amount of material within a given category, for example, while there are woefully few primary documents, there is an extensive list of popular wartime songs. This site was created for the PBS website to accompany the 1996 miniseries on World War I created in conjunction with the BBC and Imperial War Museum in England. The original site went up in 1996 and was updated in 2004 to support additional video and interactives not present in the earlier version. Although the site could be for anyone interested in World War I, it seems to be particularly directed at an audience using it for educational purposes. It has expansive educational resources including a variety of lesson plans for each of the main sections of the site structured for different grade level, extensive book lists, and links to additional resources on the war. This site seems to be set up to teach and inform the visitor and with the prominent side panels displaying the analysis of historians, it subtly establishes the presumed accuracy of the site as a whole. The creator of this site, Mike Duffy is an amateur historian who has been working on this site since 2000. As mentioned in the site goals, it seeks to attract a general readership and function as a resource for general information on the war. Duffy states in the section about the site that it is not intended for academic scholarship because it has not been formally peer reviewed; however, many respected educational resources for teachers, including the PBS site, link to this site because it covers nearly every aspect of the war in an easily digestible fashion perfect for introducing students to WWI. According to a page, which lists the site metrics, there are over 700 primary source documents and 3400 photographs on the site. As mentioned above, this site was created by a Great War enthusiast, the late Mike Iavarone and is now maintained by another amateur historian, Mike Hanlon, who also serves as the editor and publisher of the online WWI magazine Over the Top. The audience for this site also comprised of WWI enthusiasts and amateur historians. This is clear from the amount of material within a given category, for example, while there are woefully few primary documents, there is an extensive list of popular wartime songs. The active contributors are more interested in social and cultural aspects of the war as opposed to investigating the underlying causes and aftermath of it. Although it may intend to attract students doing research, the information available and ease of searching would do more to discourage them. There are no physical documents on this site; however, there are sections called “Voices of the Great War” which are spotlights on individual people with clips of actors reading from their diaries and letters and some written quotes from these sources. Each “voice” is contextualized with a brief biography of the individual and information about the events they are discussing. There is also a section with a historian’s commentary on the events, but not in direct response to the audio of the diary entry or letter. In this sense, the primary sources in audio form are being utilized to give a personal perspective to the events and topics being covered and are thus supplementary to the section. Each of the primary source documents are transcribed on the site and the actual image of the document is not available to view most times. With each primary source item, there is contextual information presented above the transcription. Since an image of the documents is not available and transcription policies are shown on the site it is impossible to know how accurate the transcriptions are. There is a very limited amount of documents available on the site and they can only be viewed as thumbnails. Transcribed versions of the documents are available, but there are no transcription guidelines present on the site. Other primary sources, such as scans of photographs are also available, but the only option for viewing them is in a fractal format (ftf), which creates very large, and high quality images. Unfortunately, it involved downloading a program that could only be supported on Netscape or Internet Explorer. The site used this format because it received many requests for higher quality and larger images. Likewise, there are a lot of audio files available, but they were created in older formats and only run in Netscape or Internet Explorer. The site appears to have a lot of interesting and unique material that provide a view of the war students are not often exposed to; however they are very difficult to access. There is no search function for this site, but there is a “War Index” which is an alphabetical index of keywords, people, battles, places and other events in the war. This appears to be fairly comprehensive and in the listing it links to the location of the item a visitor might search for and lists within which section the listing is in (e.g. historian’s commentary sections, the timeline, a particular section or subsection, etc.) These qualifications would be particularly helpful when deciding which link to choose. In addition to the index, the navigation of the site is very easy with redundancy of links at the top and bottom to the main sections and it is easy to navigate within a section. This, along with clearly labeled sections and subsections make finding information easy as well. This site uses a basic Google search bar to search the site. It is useful for pulling up information across the item types on the same topic. The search bar, combined with the navigational tools on the site, make it very easy to find information on many general topics. In addition to a sidebar that lists all the different categories of items or topics, there are links across the top to popular battles and categories, such as “poetry.” These navigational tools make searching for information fairly intuitive; however, an advanced search would make it even easier to do a more in depth search. This site boasts very easy and comprehensive searching; however it does not deliver. On the front page, there is a link to “1914-1918 Super Search” which doesn’t search the site, rather it searches the whole web. The results it pulls are not very good or relevant. For example, when searching the exact phrase “Battle of Verdun” the first ten results were from another amateur WWI site about a trip to France. This search makes it virtually impossible to identify information within the site itself. In terms of navigability, unless visitors go to the reference area, which contains a site map, it is extremely difficult to get at the information within the site. Furthermore, it is nearly impossible to navigate back and some of the links to go forward, back, home and to the search, which are on certain pages often do not work. The Great War site offers a lot of educational resources, was easy to navigate and engaging. Each page has a lot of information, but it is not overwhelming. The audio and video are of a high quality and the interactive map is easy to understand and use. It appears to be an excellent resource for students to learn about the war and gains scholarly credibility from the prominent display of historian’s commentary. Because of its intended mission to show all the influences that led to war and the consequences, it deromanticizes the war and presents just enough of the harrowing details of the trenches and bloody battles to provide a realistic view of the war. Highly recommended for a quick and easy guide to the WWI that is comprehensive in scope and contains scholarly interpretations. The First World War site is extremely well organized, easy to navigate, and filled with a lot of information. The author of the site makes it very clear what is covered in each section and is extremely transparent about who he is, the site goals, where he got the information he is using and what the copyrights are. It is updated often and well maintained. Some of the contents in certain sections could be reevaluated to encompass a greater scope of voices; however for the most part the site contains information on all the major events and themes associated with WWI. The Trenches site contains an active community discussion board and has a lot of information. Unfortunately, it was a site created in 1996 that was never overhauled to account for the great advances in website design and capabilities in the past 13 years. A user-friendlier interface that allowed visitors to actually gain access to the material stored within the server would vastly improve this site. Despite its less than scholarly focus, it does contain interesting information and back in the late 1990s it may have been a great site. However, like many sites created by war enthusiasts, it is today, grossly outdated. Its particular social and cultural history slant would make it a good companion to a more document rich site because it would provide a different view of the war. At the same time, this site does seem to romanticize the war and devalue or deemphasize the physical and psychological toll it took on the soldiers, civilians and nations involved.